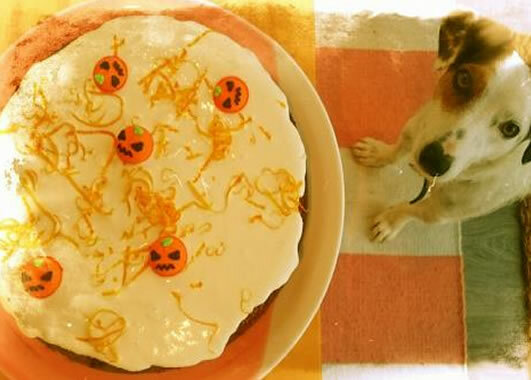 This delicious orange cake is a great addition to a Halloween feast! It is so moist and aromatic it would do well at the end of a meal – substitute the flour for more ground almonds if you want gluten free, and using Newgrange rapeseed oil instead of butter means it’s even better for you! I added a good slug of grand marnier (or any orange liquor) to mine at the weekend, which went down well with my guests! The oranges at the moment are coming in to peak season – go for the extra large ones which are much more juicy and usually less pippy. I like to get down to the old school fruit n veg market on the fairgreen in Navan on a Friday morning, with 40 years trading they know a good orange! You can make the cake a day or two ahead which gives you lots of time to concentrate on your costume! Bon appetit! 1. Preheat the oven to 170C/150C Fan/Gas 3. Lightly grease a 23cm/9in springform cake tin with butter. 2. Zest three of the oranges into a large mixing bowl and set aside. 3. Remove the pith from the three zested oranges and discard. Roughly chop the orange flesh, removing any seeds as you go, and place it into the bowl of a food processor. Blend well, adding the rapeseed oil as you blend until the mixture is smooth and well combined. Set aside. 4. Add the eggs and 250g/9oz of the caster sugar to the bowl containing the orange zest. Using an electric whisk, whisk the mixture until it is pale, thick and creamy, and leaves a trail when the whisk is lifted from the mixture. Stir together the flour, ground almonds and baking powder in a separate bowl. 5. Carefully fold half of the pureed orange mixture into the egg mixture. 6. Fold in all of the flour, then fold in the remaining pureed orange mixture. 7. Pour the cake mixture straight into the prepared cake tin and bake in the oven for 1 hour, or until golden-brown and risen. Check the cake is cooked by inserting a clean skewer or knife into the centre. If it comes out clean, then the cake is ready, if not, cook it for a further 5 minutes and check once more. 8. While the cake cooks, prepare the frosting. Whisk the cream cheese, creme fraiche and icing sugar together in a bowl until smooth and thick, then chill in the fridge, covered, until needed. 9. Peel the remaining 2 oranges with a vegetable peeler, then julienne the zest very finely. 11. Strain the julienned orange zest through a sieve suspended over a large bowl (the orange-scented sugar syrup can be chilled and used in an orange drizzle cake recipe or another recipe). 12. Sprinkle the remaining caster sugar onto a plate and dredge the julienned orange zest in it until coated. 13. Remove the cake from the oven and set aside to cool slightly in the tin, then turn it out set aside to cool completely on a wire rack. 14. When the cake has cooled, spread the cream cheese frosting over the top and decorate with the orange peel and sugar pumpkins. “Hi I’m Ingrid Berry, I’m an artist living near Slane, County Meath, originally from the UK. I trained as a fine artist in London for 5 years during which time I did a lot of cooking for the great and good, on big estates in England, Scotland and Ireland. I learnt to cook at the Grange Cookery school in Somerset which is an essential platform into private kitchens. Since then I’ve gone onto produce art and food events to promote creativity, craftsmanship and embrace a movement away from an ever encroaching technological media world that for me does little to build community spirit. I’ve spent time on the continent, Italy, Spain and France, as well as further afield in Mexico, and their passion and reverence for delicious home cooked food, shared together in each others homes, street fiestas, and gatherings is inspiring. The time and care put into cooking the food shows how much importance it has culturally, and there is a noticeable difference in the idea ‘good quality is worth paying for’. This food culture is something I’d like to see more of here in Ireland, so if there is anything food related, however small, you’d like to share with me please do! I am so excited about the world class produce available here in County Meath, which you pay such a premium for in London. Recently I saw a group of Americans loading up bags of Irish butter to take back to USA – the best butter in the world! The meat, cheese, fish, lobster, Crab… Follow my blog to hear more details about all of these. I’m thrilled to be able to share with you all some of my ideas for entertaining, easy suppers, kid friendly bites…and even doggy treats! My Percy pooch is my pride and joy and although I don’t like to admit it is a very fussy eater! his absolute set in stone wanderlust is chicken basted in Newgrange Gold roasted to a golden crispy skin served warm slathered in pan juices followed by a really nice bowl of cold water. The oils at Newgrange Gold are a staple in my kitchen – the high burning point makes them versatile for all types of cooking, the colour and flavour makes a super addition to any number of dishes, and the health benefits gives much welcomed reassurance to consuming! In our blogs, Percy and I will be looking out for the best of the season, and recipes to share at our tables together. I hope you’ll have as much fun making them as we do! If you’d like to share your thoughts with us on the recipes or the oil then please get in touch, we’d love to hear from you.